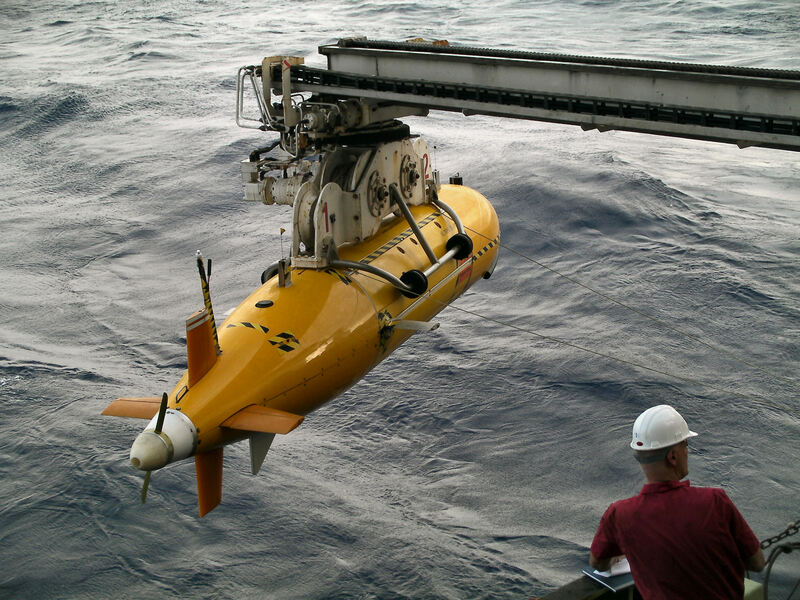 The Autosub6000,(see photo on the right/above), was developed by British engineers and can dive to a depth of 6000 metres. One of its most spectacular feats was the investigation of the Cayman trough in April 2010. 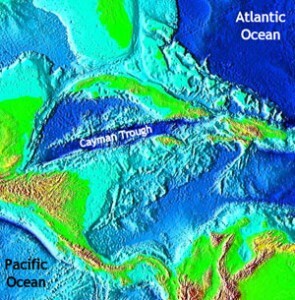 Map of the Cayman Trough is shown on the left/above. Both illustrations are courtesy of the UK National Oceanographic Centre, Southhampton (NOCS). The discoveries of life in the vicinity of thermal vents several kilometres below the ocean surfaces has totally revolutionised all previously held ideas about life and the beginning of life. For a start some of the types of organisms living in the abyssal depths are so bizarre and even stranger the most outlandish ideas of science fiction. At the bottom of the food chain are hosts of anaerobic microorganisms which thrive under the conditions of temperature and pressure undreamt of by earlier biologists and prosper in high concentrations of hydrogen sulphide and other toxic compounds. They provide food for animals that, although using dissolved oxygen as all animals do, are able to live in the noxious mixture of chemicals that are deadly poisins to most forms of animal life – in fact at the top of the food chain are carniverous octopi, a highly evolved and intelligent life form. As well as such familiar creatures there are many types of animal life that have never been seen before such as tube worms and siteless shrimps. Some of these (tube worms, octocorals, crab and octopus) are spotted near vent. ring/chimney of fire expedition 28 June-5 August 2002 as illustrated below - courtesy of the United States National Oceanic and Atmospheric Administration (NOAA). The really significant fact however is the presence of the primitive microorganisms which belong to a type known as extremeophiles. They can live at fantastically high temperatures and very acidic conditions as well as metabolising through unfamiliar biochemical pathways. Some are bacteria and others belong to an entirely different life kingdom known as the ARCHAE. It is not yet proved but is highly strongly indicated that life began in the abyssal depths of the oceans and not in the shallow sunlit waters of the continental shelf. Long before a time when a special group of bacteria (the cyanobacteria) filled the air and the waters with molecular oxygen, the only life that existed were microbes to whom oxygen was a deadly poison (we call them anaerobes). Among them were the Archae similar to those that even now inhabit the abyssal depths at the volcanic thermal vents. Although they are very different to the familiar forms of life we know at the surface of the Earth, they have one thing in common they are composed of chemicals called nucleic acids and proteins and grab energy from their surroundings by uniting two 'molecules' of adenosine diphosphate and phosphate ions into adenosine triphoshate. They also use a number of special chemicals called co-enzymes which are related to vitamins. Although their metabolism is somewhat bizarre and their genetics more simple they still use the same basic biochemistry as all the organisms with which we are familiar including the higher plants and animals. In a sense all life is one life - the same basic rules of biochemistry govern all archae, bacteria, fungi, plants and animals so far found on Earth. This suggests that life had a common origin probably only a few hundred million years after the formation of our planet. If so why only one form of biochemistry – why should one form only have evolved. This is a question of paramount importance. Did it only start once or did it start many times in many places (probably many different thermal vents) and if so why did only one form triumph. To answer this question we have to go even further back to a time before cellular life began – to a time of chemical evolution. Somewhere and somewhen in the stygian darkness of the abyssal depths small molecules were evolving into large molecules and these large molecules were beginning to replicate copies or near copies of themselves. Thus 'CHEMICAL EVOLUTION' must have preceded 'BIOLOGICAL EVOLUTION' and to understand what this implies we must begin by explaining a little CHEMISTRY and the Chemistry of Life.